The First Auridon Marines are the royal guard of Queen Ayrenn. A Hostile Situation: Bring a traitor to justice. Breaking the Barrier: Help the Battlereeve and the Guild gain access to the Firsthold Castle. Real Marines: Rescue and rearm the real Auridon Marines. 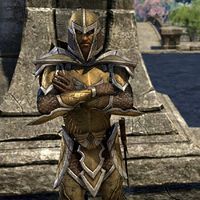 Sever All Ties: Help save Auridon from the Veiled Heritance and their Daedric allies. Teldur's End: Help rescue the local canonreeve. Through the Ashes: Help stop the Daedra from overrunning Dawnbreak. To Firsthold: Seek out the First Auridon Marines at Firsthold. This page was last modified on 23 October 2017, at 21:17.